This gorgeous recipe comes from the beautiful blog ‘thehealthymaven.com’, which I only recently discovered. When I saw this recipe I knew I had to try it and over the few times Ive made it I’ve made a few adjustments to it for my own personal taste. All credit goes the Davida (The Healthy Maven) as she created the original recipe, this is just my version of it. I’ve made this recipe several times, trying out different things and I have learnt a lot from it. Firstly do not add lots of different types of mushrooms to it gives a very strange taste when mixed with truffle oil. I tried using a mixture of chestnut, oyster and shiitake mushrooms, and while it was edible it was not that palatable in my view. I’ve tried adding the stock, as the original recipe suggests, however each time I did it turn into a soggy mush, no matter how long and patiently I waited so in my version I have not added it. It seems to detract from the delicious truffle flavour as well. Truffle oil generally comes in small bottles (around 50mL) and it will go off after about 6 weeks of opening, so find as many uses for it as you can. I would always buy good quality truffle oil, and it’s best if it has little bits of truffle in the oil still. Store in a cupboard, away from direct sunlight, as it will oxidise. Do check out and try the original from Davida’s blog and my version and see what you think. In a large frying pan or skillet, heat 1 tbsp of truffle oil over a medium heat before adding in the chopped onions, garlic and dried thyme. 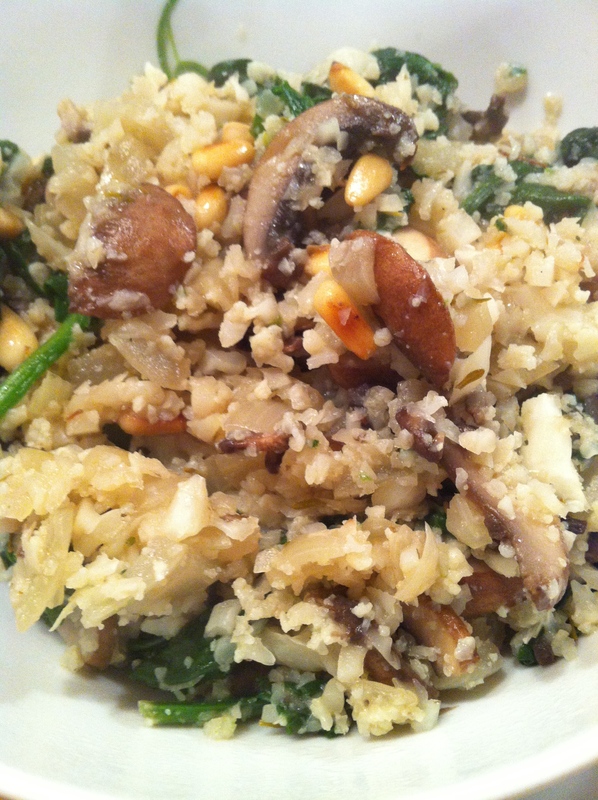 In a food processor, add the cauliflower florets and blitz to make cauliflower rice, set to once side.Once the onions have softened, add in the mushrooms and continue to cook. 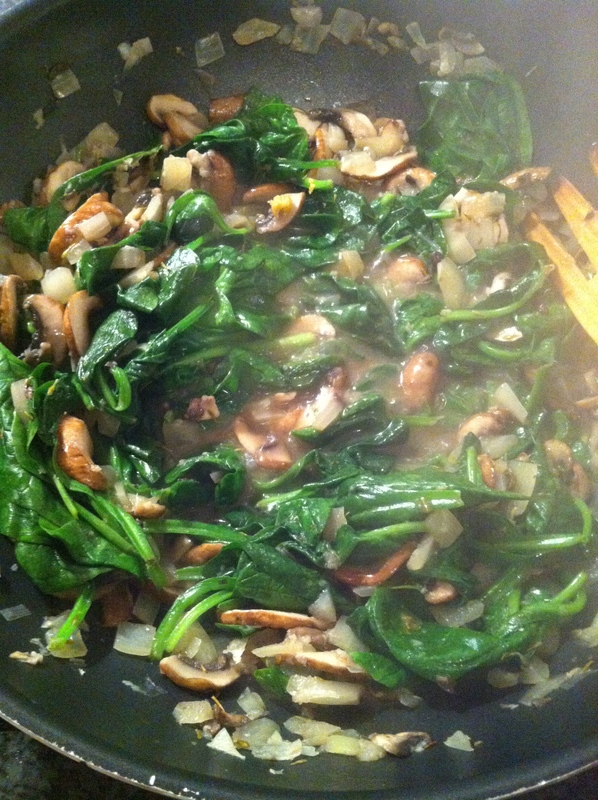 Once the mushrooms are done add the spinach and clamp on a lid to allow the spinach to wilt down. Once it has started to wilt, mix in well with the rest of the risotto mix. Add the cauliflower rice and stir in well, season with white pepper and continue to cook over a medium-high heat until the cauliflower loses it’s raw smell. 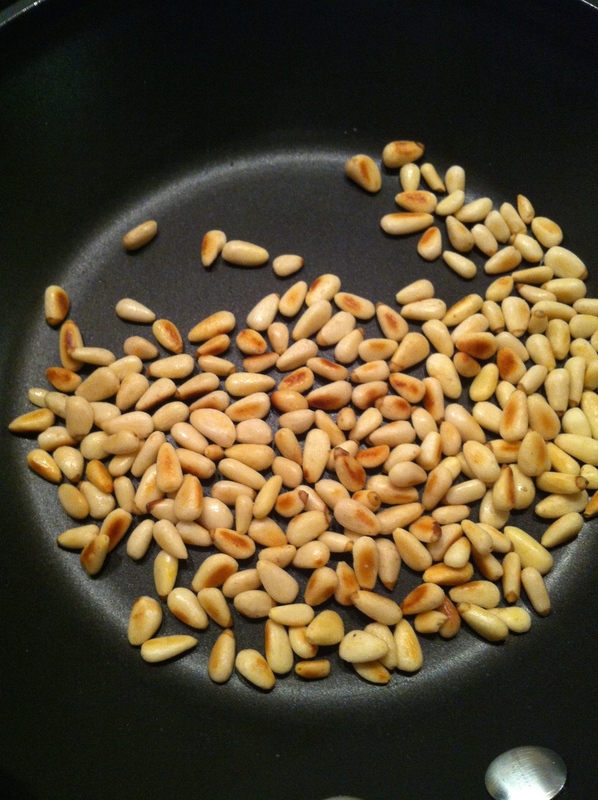 In a separate, small frying pan, toast the pine nuts over a high heat. Ensure you keep the pan moving and don’t leave for too long. They should take between one to two minutes to become toasted. 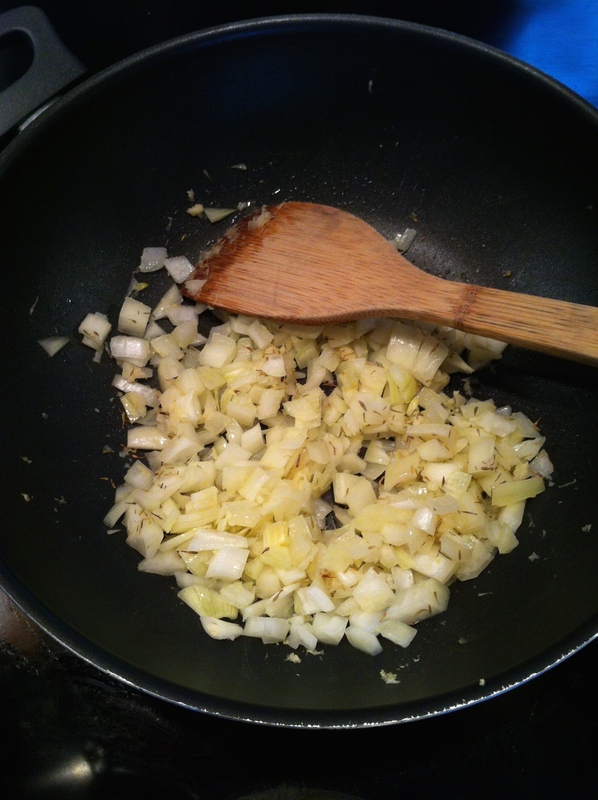 Stir in the last tablespoon of truffle oil to the risotto mix and then add the toasted pine nuts. Add to a bowl and serve.